It’s A Diesel Jim, But Not As We Know It. I’ve tested a few diesels now and generally not only do most of them sound like they should be towing 30 tonnes of logs across the countryside, the odd one feels like it is doing just that. 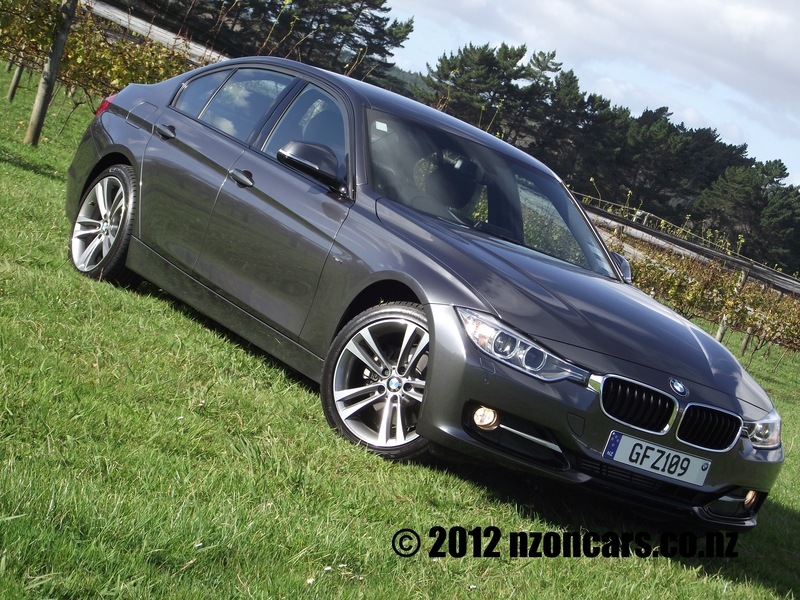 This isn’t the case here with the 2012 BMW 320d. Sure, from outside the car, the pedestrian you’re about to run down will hear the familiar diesel clatter and get out of the way, while inside you’ll never notice the truck like soundtrack. The performance of this two litre TwinPower four cylinder Turbo diesel is nothing truck like at all. On the centre console there’s a rocker switch with Eco Pro and Sport written on it, there are four settings here starting with the most economical option which enables BMW’s EfficientDynamics technology. The next setting is the comfort mode, the default setting when you start this euro beauty, this makes everything perfect for day to day driving and commuting, almost like the car is effortlessly picking you up with a soft velvet glove and placing you gently at your destination. Next up we have the sport mode, oh yeah, this is where things get a whole heap more serious, the suspension stiffens up, steering tightens, in fact the whole machine turns into some sort of wild animal, one that is not going to maul you to death but would be more likely to have fun with you so you can both enjoy the experience. Then there’s the fourth mode, Sport Plus. When I picked the car up I was told not to use this option, it is ‘advisable’ that it is only used by more experienced people like race drivers. Hmmm, interesting. This gives you all the settings of sport mode plus switches the stability control system off. Well here’s me thinking ‘it’s a diesel surely it’s not going that much of an issue’, guess what, I was wrong! Gee, that doesn’t happen often, although my wife might argue with that statement. In reality this setting turns the machine into that same wild animal but instead of playing with you it’s more than likely going to grab you by the scruff of the neck, slam you against a wall and pummel the hell out of your face with its claw! And, although the stability control system switches off you still do have a small safety net, like a park ranger ready to step in at the last minute right before the wild beast finishes you off, in the form of a smidgen of traction control to keep things in check. Very handy when pushing this rear-wheel-drive technical wonder a wee bit too hard through some bumpy ‘S’ bends, not that I did of course, especially in Sport Plus. Really, I didn’t. Incredible thing with the 135kW, 380Nm Diesel engine is the economy. BMW claim an easy on the wallet 4.4 litres per 100 kilometres which is simply quite amazing considering the performance it puts out. 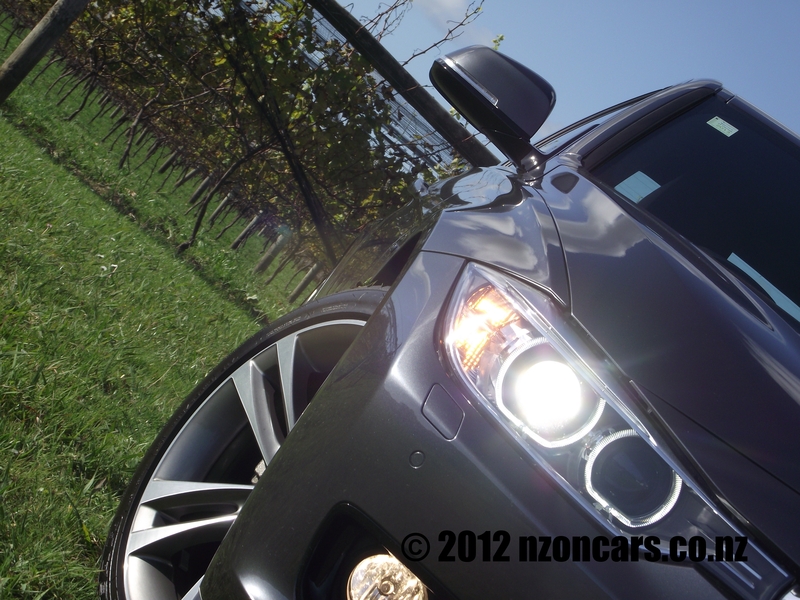 Even during my heavy footed test of GFZ109 I returned the car to BMW HQ with a generous amount of fuel in the tank after travelling nearly 700 kilometres in the three short days it took to fall in love with all the electronic gadgetry available to the driver. You could sit for hours in the comfortable leather clad sport seats, complete with electrically adjustable side bolsters, flicking through the BMW iDrive system. 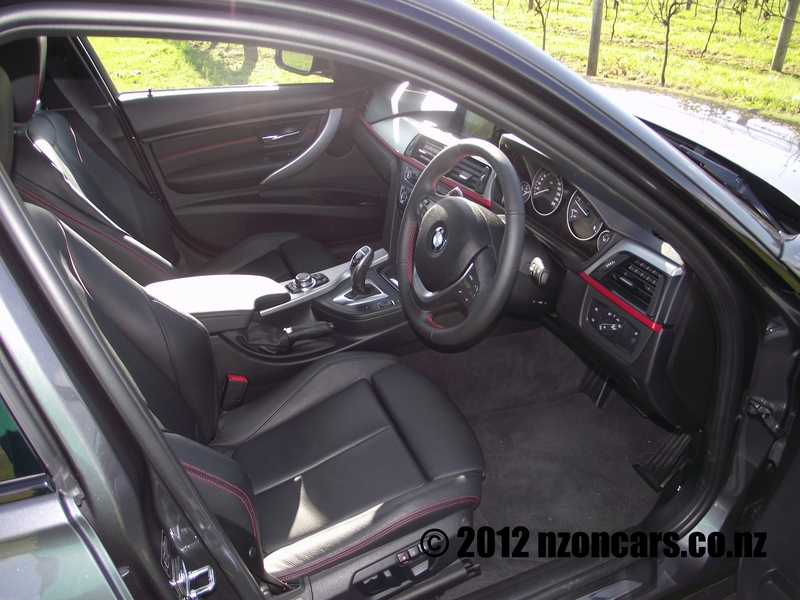 There are many many many options here for customizing just about every aspect of the car for your own personal comfort. From setting up how long the headlights stay on after you lock the car right down to the colour of the interior ambient lighting. Also in the iDrive system is the full owner’s manual which can be viewed on the full colour 6.5” display. Also available on the display is the easy to use navigation system and full iPod connectivity which displays all the iPod information including album art. All good if you’re into gadgetry stuff like that and I am a gadgetry type of guy. Whilst the colour screen is very good and well placed for viewing on the top of the dash, it does kind of look as though it has just been plonked there as an after thought. I initially thought it must slide down into the dash or at least lay flat when the not in use but not so, it just sits up there almost like an after-market accessory. Comfort levels are extremely high and driving this smooth and sleek looking sedan is a very pleasant affair. Smooth, quiet and comfortable for the daily commute, just enough room for the family on the weekend and then sporty enough for a track day at Hampton Downs should the urge come over you. 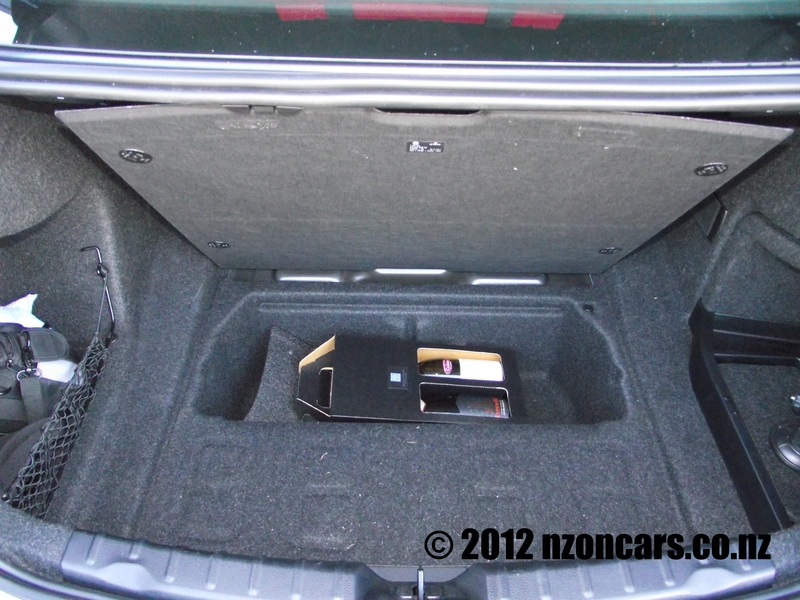 Boot space is good with the lack of a spare tire thanks to the run-flat tires. There is even a very handy compartment under the floor of the boot just perfect for a couple of bottles of wine from Matua Valley Wines in Waimauku who I would also like to thank for allowing me to use their stunningly picturesque vineyard to do the sleek lines of this 3 Series justice. 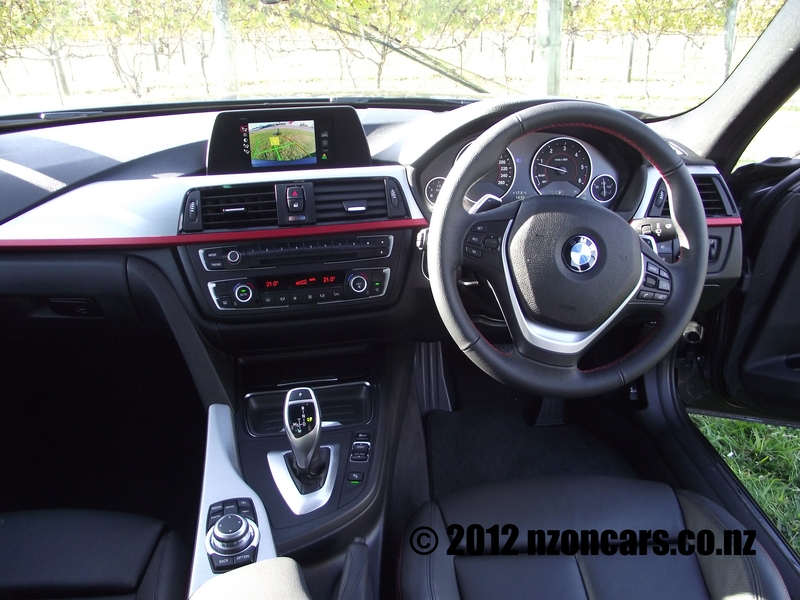 The 320d has a recommended retail drive away price of $74,700 but the model tested included $11,450 worth of additional options such as the Sport Line package at $3000 that basically consists of red colour highlights throughout the cabin, and also on the key. Also on the options list were variable sport steering, xenon lights, high-beam assistant (a $250 dollar option which the one time I purposely left the high-beam lights on for an on-coming motorist didn’t activate and promptly blinded them, my apologies to said driver! ), very smart 18” alloy double spoke wheels, rear view camera and the navigation system among others. In all honesty if I was to walk into a showroom to buy a car I would expect to buy a car for the advertised price, or less after some haggling, and certainly would be a tad peeved a few weeks down the road wishing I had splashed out on at least some of the extras. Aside from BMW giving you the choice to fully customise your shiny new box of luxury to your own tastes as some people would like to, I personally would rather just have a set price and not sit there with a calculator trying to decide if I want this bell or that whistle. 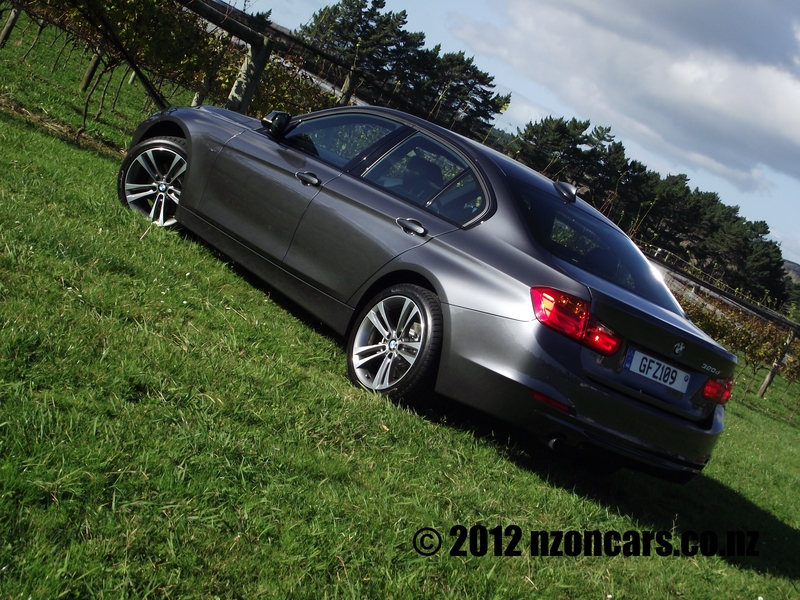 All in all this new 3 series Beemer has everything you would ever need and then some. Driving all day and night would be so comfortable and effortless you just won’t want to stop. 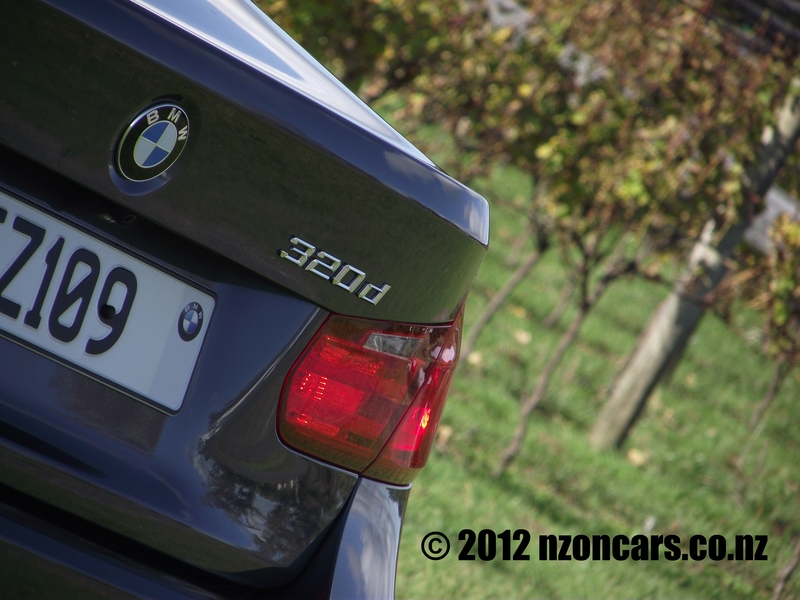 Always been a fan of the 3 Series but there has been the odd model that wasn’t as easy on the eye as the previous. This one however has to be one of sleekest and tidiest I have ever laid my Specsavers clad pupils on. I have been left feeling I want one. But I’d probably go for a wagon and would definitely try to splash out a few more dollars to add some M badges to it!